A premium mobile onboarding process offers your customers a frictionless way to capture and provide self-servicing trailing document to increase retention rates. Power your app with Mobile Capture and deliver exceptional customer experiences by making mobile document capture easy for your customers with a simple process: point and capture. ABBYY Mobile Capture is an SDK which offers automatic data capture within your mobile app, providing real-time recognition and capturing photos of documents for on-device or back-end processing. Meet your customers’ expectations by minimizing manual interactions within your mobile apps and maximizing the ease-of-use for the end-user. Easy to integrate, pre-built, comprehensive mobile capture solution for your mobile application which saves development time and delivers best quality results at the same time. Increase your growth and retention rates by creating smooth mobile customer experiences throughout the onboarding journey. Across industries, quality self-service processes are essential in retaining customers within the onboarding journey. Integrating ABBYY’s Mobile Capture SDK into your app, provides your customers with a seamless, automatic and accurate way to submit trailing documents within customer service scenarios. Mobile document input is valuable in supporting cross-industry onboarding scenarios. Effectively use mobile devices as front-end document and data input for back-end processing. 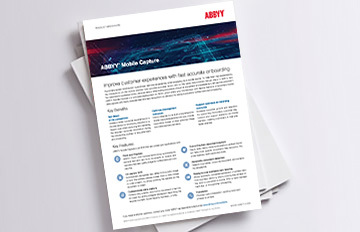 Learn how the software development kit ABBYY Mobile Capture can help improve your customer onboarding experiences. South Korea's premier search engine provider NAVER is powering its app with ABBYY Mobile SDK features so users can immediately retrieve search results without pressing the search button or manual typing.